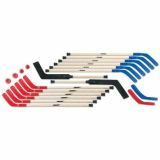 You can count on these strong hardwood shafts and reinforced plastic blades for durability. A well-made traditional wood set. 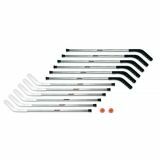 Includes 12 wood sticks, 2 wood goalie sticks, 2 hotballs, 2 soft shot pucks, 2 replacement blades and instruction booklet. 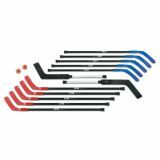 LTG Stands for LifeTime Guarantee, and these are the strongest and most durable sticks in the world! Made in the USA, the LTG is a cost-effective, strong, and durable stick that will not crack, break or splinter because of the tough plastic shaft which is reinforced by a fiberglass dowel.